The sheer pace of changes in world of technology sometimes scares me. Four years ago, Google Chrome was a nobody. After the initial surge, which helped Chrome gain nearly 1% market share quickly in the fiercely competitive browser market, things went down a bit and everyone was busy writing away Chrome already. After 4 years of stupendous growth, latest Statcounter stats shows that Chrome is now the world's most popular web browser dethroning mighty Internet Explorer comprehensively. Browser usage statistics can be tricky. Among the most reputed organizations whose statistics are considered reliable include StatCounter, Wikimedia, W3Counter and NetApplications. Let's find out what each one says. According to latest August 2012 statistics by W3Counter, Chrome now leads the pack with a 28.3% overall desktop market share against Internet Explorer's 27.6%. 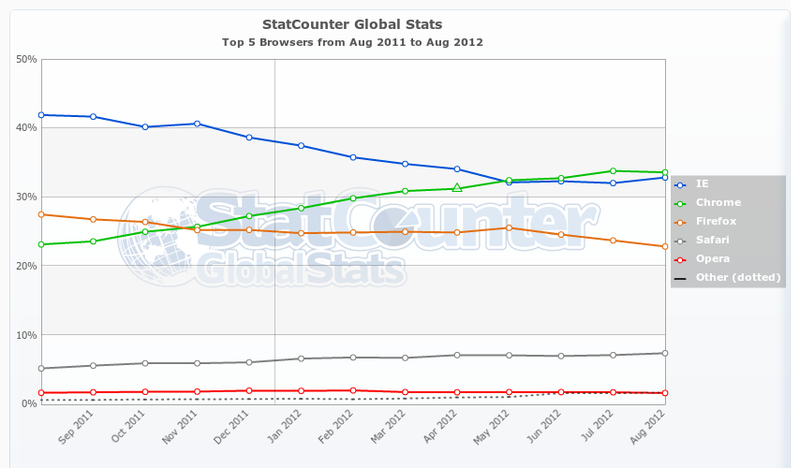 Firefox grabs the third spot with 22.8 % market share. StatCounter statistics also show the same trend. 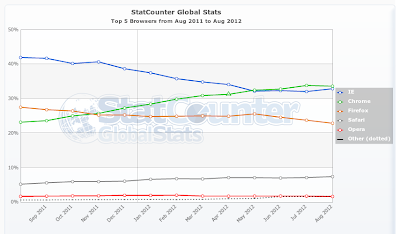 Chrome taking the top spot with 33.59% market share in August 2012 while IE has a 32.85% market share. 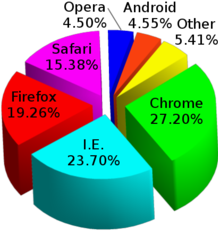 Wikimedia statistics for July 2012 shows that Chrome now occupies 27.20% market share against IE's 23.70%. In August 2012, Chrome improved its numbers slightly to reach 27.25%. NetApplications has a different take on things. According to NetApplications statistics, Microsoft's IE still rules the roost with a mammoth 54% market share. Firefox is a distant second with 20% share while Chrome holds on to just 19%. Statistics are like that. They can't give you exact numbers but they are always good pointers to what the market trend is like. And the story here folks, is the unabated growth of Google Chrome and a steady decline of once mighty Internet Explorer.